Home Health Lifestyle I'm not lazy, I have a chronic illness. When people tell me I look perfectly normal and that there is nothing wrong with me I always end up rolling my eyes so far to the back of my head that they get stuck (ok nearly all the way to the back of my head). 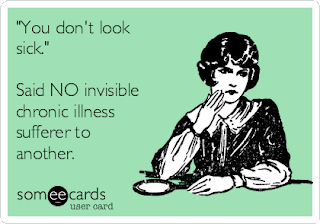 I have an invisible chronic illness, meaning mine isn't physical, mine is only physical when I pass out which I try to hide form others, how do I hide it? I try and avoid going most places that involve me having to stand up, such as shopping, hanging out with friends, going out for drinks if there is no where to sit or rest I won't be there. There have been many times that I have tried to push on and make myself stand but this only makes things worse for me, I get terrible headaches and feel sick (even end up being sick) I feel dizzy every single day of my life. I get told that surely they can do something to make me better, just take medication and you will be fine. That isn't how it works, it's a long and stressful road trying to control a chronic illness, especially now my cardiologist has told me he can no longer do anything to help me, I feel lost and have no idea what I'm suppose to do now. I just want to be normal, I want be able to hang out with people with out having to find a chair to sit down on, or lie on the floor, I want to be a normal 27 year old. My main problem is that I have a chronic illness as well as a heart condition and the two don't mix together at all, I was talking to someone a few years back who said and I quote "why not just use a wheelchair if you faint standing up all the time", that really isn't the answer for me, I faint sitting and standing, bathing or showing, my Neurocardiogenic syncope has got worse the older I get and all I want is to have some control over my body. I put on weight and then I lose it, exercising is very hard and exhausting for me, right now I'm trying to lose weight again because after my pregnancy I gained weight very quickly, HG (Hyperemesis Gravidarum) may of made me lose weight due to throwing up constantly but as soon as I had the termination the weight came back very fast even though I wasn't eating that much at the time, now I'm eating normal meals (trying to at least). I keep getting told to get up and move around and stop being lazy, apparently I'm making myself more ill by being lazy when in reality it's bloody hard to get up and move around, I cry, I get depressed, I take my anger out on others but at the end of the day It's not me being lazy, It's me trying to not faint on a day to day basis. I do have a wonderful support network and my boyfriend doesn't make a big deal when I faint, he treats me just like I have tripped or something which I like because I don't want attention drawn to the fact I have NCS I just want people to understand that I have it, I can't change it and when I can't go somewhere It's not because I can't be bothered, It's because my body can't deal with it. So if you're a friend or family member reading this, please don't get mad at me if I can't come and visit, or come on that shopping trip you wanted us to take, If I say I'm not feeling up to it, It's the truth, It's not me being lazy. I feel so much better for getting that off my chest!